Udupi is known for its flavourful cuisines. Udupi cuisine is one of the noted styles of cooking in the southern part of India. Sambhar, kosambari, scrumptious dishes with colocasia and jackfruit, dosas etc. are the showstoppers of this cuisine. But I encountered this cuisine through a very humble dish – Hayagreeva Maddi. My aunt made this dish for me and I fell in love with it. Every time I meet her, we mention it at least once and laugh to ourselves. To me, this dish is much more than just a lentil based sweet with a mythological origin. When I asked her what it exactly is, she handed me this elaborate book on Udupi cuisine and asked me to read a three page long story which I have conveniently summarised for you. A goldsmith was once trying to make an idol of Ganesha. But each time he tried to do that it ended up having a horse’s head instead of an elephant’s. He kept trying, melting the gold and remoulding it. But each time he ended up with a horse’s head. Finally he got tired of it and threw it away. The same night, Lord Hayagreeva– Lord Vishnu’s horse faced incarnation appeared in Sri Vadiraj Swami’s dream and asked him to pick up his idol which has been thrown away and worship it daily. 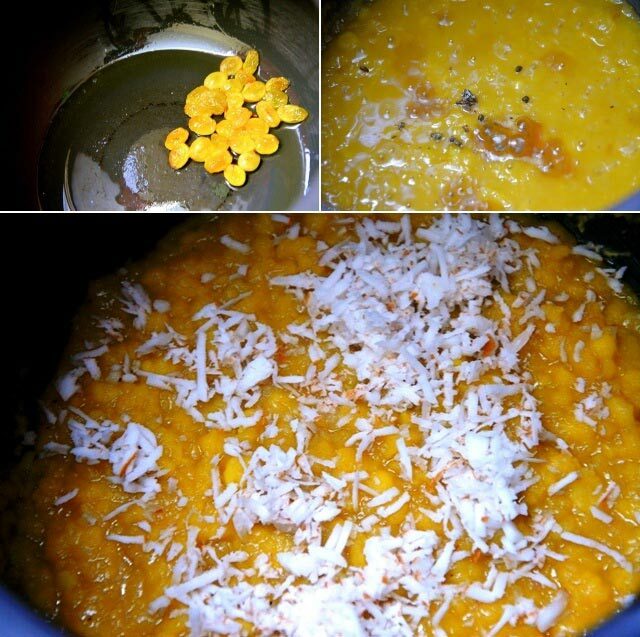 The idol was then worshipped and as horses supposedly like chana dal or Bengal gram, this delicacy using cooked Bengal gram with jaggery and coconut called maddi used to be offered to the Lord. It has since been known as Hayagreeva maddi. This is an incredibly simple dish and gets over in minutes, my contribution being quite a significant one! 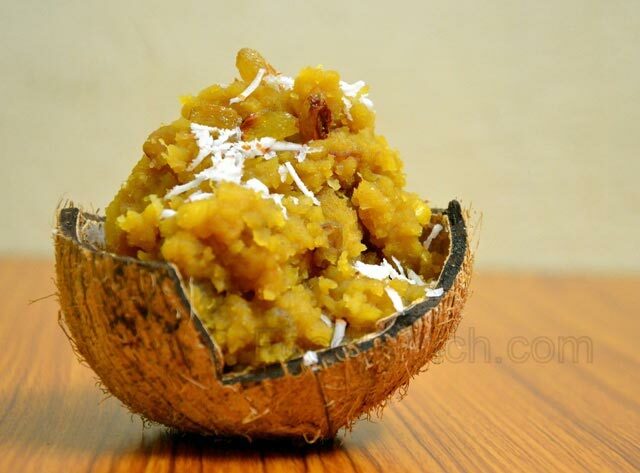 Please feel free to adjust the amount of jaggery and coconut; it should be as per your liking. Same goes with ghee; you can add more or less ghee according to your dietary and gustatory preferences. Understanding what you want from your food is all that matters when you cook. Narrate this story every time you introduce this sweet to someone, it makes the experience so fascinating. Hope you enjoy it! Few nuts and dry fruits of your choice cashew and raisins taste best; quantity is again your choice (Optional). A pinch of cardamom powder. 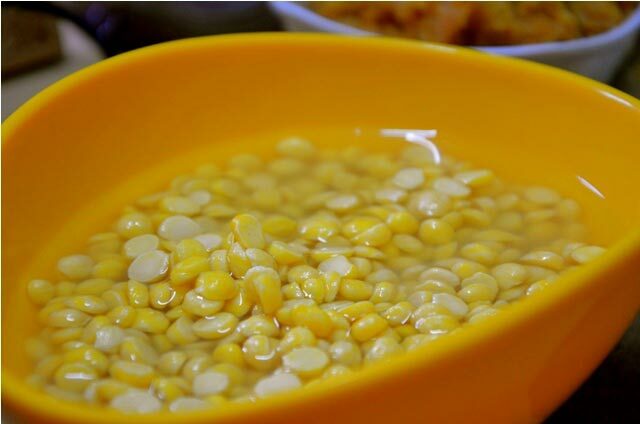 Cook the soaked chana dal in sufficient amount of water. I used a pressure cooker because it is fast and energy efficient. Once the dal is cooked, Mash it up slightly. Add a little bit of the ghee into a pan and fry the nuts till they are lightly golden brown. I used raisins. Remove the nuts and drain the ghee. In the same pan add the cooked dal and keep stirring it on medium heat till the dal starts thickening and boiling. Add the jaggery and cardamom powder and mix well till the jaggery is melted. On stirring for another minute or so, you will observe that the mixture is thickening and clumping together as a mass compared to its previous semi liquid state. 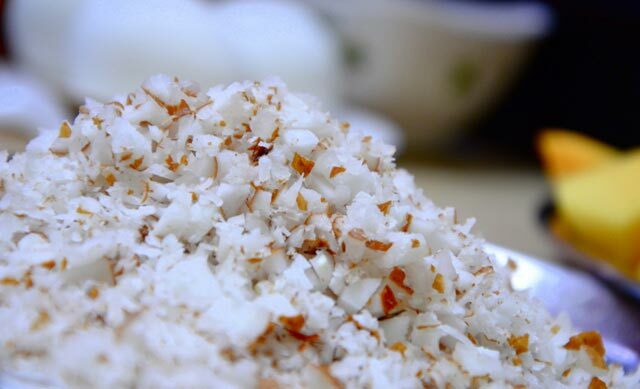 This is the time to add in grated coconut, nuts and ghee. Mix well and simmer for another thirty seconds or so and remove from heat. Don’t over thicken the mixture, it will become too dry and excessively sweet to taste. Do keep in mind that the mixture tends to get slightly drier or thicker as it cools. It will assume the consistency of loose dough or a pliable halwa. now am i using my id???? hey amu check out the desserts you might want to try out some of them. maybe when i get back home or something.